I’m not sure about you but when I feel the need to get a little perspective, I get in my trusty Jeep and drive. Yesterday was one of those “must escape the city” days when I just needed to see the horizon, feel the autumn sun on my face and remind myself how fortunate I am to have the freedom to escape. I was not disappointed. I took to the back roads through the lovely Caledon Hills, wending my way northwards to who knows where? 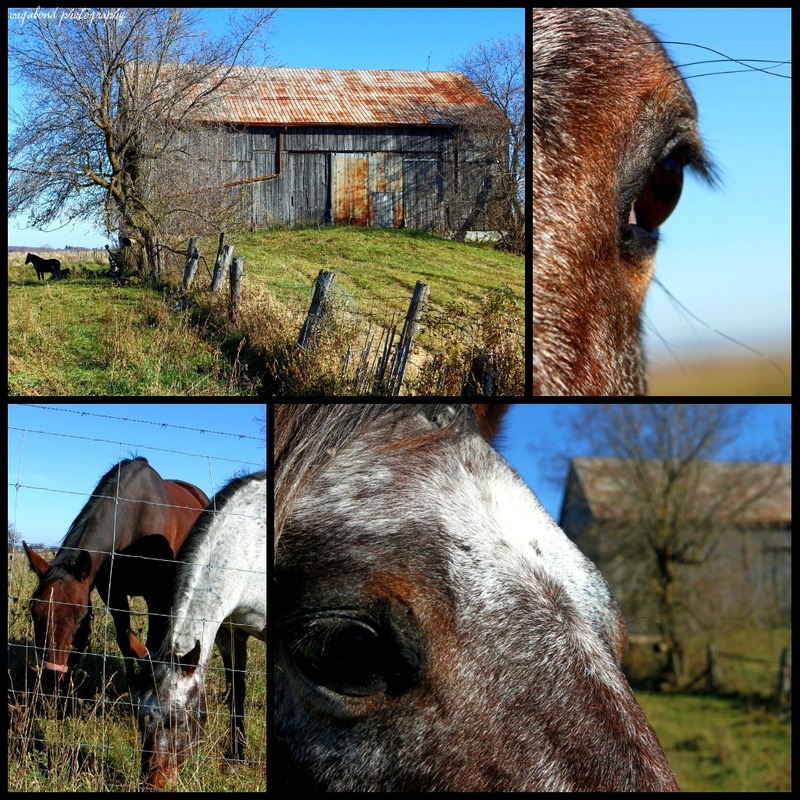 On one such back road I found an idyllic old farm, with a traditional Ontario barn still in good nick, a long barn hill, an old fence-line (a perfect lead line for a snap with some drama and perspective) and a few horses grazing in the adjoining field. Aha! Perfect photo-op! What I did not expect was the snaps you see above. To get a better shot of the barn I had to climb down a steep ditch, up the other side and peer through a barbed-wire fence. I took a few snaps and turned to go when the horses you see in the first photo raised their heads and slowly made their way towards me. Like any good farm girl worth her salt, I love animals. All of them. So when these two horses came up to the fence I talked to them gently and put my hand out, palm up (the horse version of an olive branch). Both gently nuzzled me and put their heads forward until their foreheads touched mine. Their warmth, soft touch and trust warmed my heart and touched my soul. I just stood there and breathed in, appreciating the moment. I did get my “perspective” shot, but I was also reminded not to be afraid to put my hand out, palm up. Wonderful, unexpected things can happen. Have you ever thought of making a coffee table book with all your wonderful photos and your thoughtful words of wisdom? I’ll buy one! Hey, thanks Connie – I just may! Thanks for your kind words! You might even publish your book online as Heidi did. Definitely on the studio tours in the future. Christine, it is so good to hear from you! How have you been? Doing ok at this end, and yes, this fall has been amazing. Lots of opportunities for photos! Let’s get together for coffee sometime soon? Hey Patti. I’m in Nova Scotia until Christmas. Writing, looking out over the ocean. But coffee at Christmas or in the new year, yes? Nice! And yes – a coffee at Christmas would be fantastic!